I trust you are well and your worm farm is in full swing. Today I want to deal with the subject of brewing worm tea. We regularly get questions from worm composting friends that refer to worm tea and so I thought it would be a good opportunity to share some of my thoughts about it and hopefully either confirm your own experiences or clarify things for some of you who haven't engaged with the subject yet. What will you need to brew worm tea? - a bucket of at least 10 liters / or 2.2 gallons, - chlorine free water, - a food source (molasses) for the micro organisms that you want to multiply - a fish tank air pump - and some worm castings. 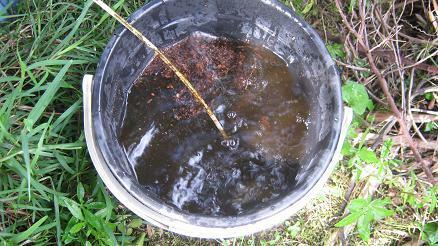 1.Fill your bucket with water that is chlorine free. If you don’t have access to pond water add the air stone, switch on the air pump for 12 hours and let the chlorine evaporate. Why 24 hours? It is difficult to work out exactly when the food source which in most cases is molasses will be running out but most worm composting experts estimate it to be after around 24 hours. At this stage the worm tea should be at its best with the most beneficial micro organisms active that the tea can possibly hold and produce. It will explain in detail all you need to know to create an income with your earthworms! It is exceptionally low priced at the moment available as a printed soft cover book at Amazon or a Digital version on the "Kindle"
The worm tea should be used as quickly as possible (within a few hours) to offer plants and soil the best treatment they can get. Worm tea will stay beneficial for a longer period but will definitely be at its best fresh. In my opinion it doesn't make sense to brew your worm tea for 48 hours or even longer as you just would have to add more molasses to your brew at a later stage to keep the micro organisms alive. Have a look out our worm tea brewing page to get some more information about worm tea. If you have any further questions or suggestions please feel free to contact us. Stephan Kloppert Author of "How to start a profitable worm business on a shoestring budget"